Editor's note: Joseph E. Stiglitz, professor at Columbia University, was awarded the Nobel Memorial Prize in Economic Sciences in 2001 for his work on the economics of information. Stiglitz was chairman of the Council of Economic Advisers during the Clinton administration before joining the World Bank as chief economist. 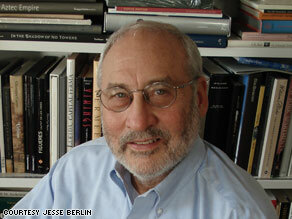 Economist Joseph E. Stiglitz says the strategy followed by the architects of the bank bailout was flawed. (CNN) -- America's recession is moving into its second year, with the situation only worsening. CNN/Money: Bigger bank bailouts coming? Leverage, or borrowing, gives big returns when things are going well, but when things turn sour, it is a recipe for disaster. It was not unusual for investment banks to "leverage" themselves by borrowing amounts equal to 25 or 30 times their equity. At "just" 25 to 1 leverage, a 4 percent fall in the price of assets wipes out a bank's net worth -- and we have seen far more precipitous falls in asset prices. Putting another $20 billion in a bank with $2 trillion of assets will be wiped out with just a 1 percent fall in asset prices. What's the point? It seems that some of our government officials have finally gotten around to doing some of this elementary arithmetic. So they have come up with another strategy: We'll "insure" the banks, i.e., take the downside risk off of them. The problem is similar to that confronting the original "cash for trash" initiative: How do we determine the right price for the insurance? And almost surely, if we charge the right price, these institutions are bankrupt. They will need massive equity injections and insurance. There is a slight variant version of this, much like the original Paulson proposal: Buy the bad assets, but this time, not on a one by one basis, but in large bundles. Again, the problem is -- how do we value the bundles of toxic waste we take off the banks? The suspicion is that the banks have a simple answer: Don't worry about the details. Just give us a big wad of cash. This variant adds another twist of the kind of financial alchemy that got the country into the mess. Somehow, there is a notion that by moving the assets around, putting the bad assets in an aggregator bank run by the government, things will get better. Is the rationale that the government is better at disposing of garbage, while the private sector is better at making loans? The record of our financial system in assessing credit worthiness -- evidenced not just by this bailout, but by the repeated bailouts over the past 25 years -- provides little convincing evidence. But even were we to do all this -- with uncertain risks to our future national debt -- there is still no assurance of a resumption of lending. For the reality is we are in a recession, and risks are high in a recession. Having been burned once, many bankers are staying away from the fire. Besides, many of the problems that afflict the financial sector are more pervasive. General Motors and GE both got into the finance business, and both showed that banks had no monopoly on bad risk management. Many a bank may decide that the better strategy is a conservative one: Hoard one's cash, wait until things settle down, hope that you are among the few surviving banks and then start lending. Of course, if all the banks reason so, the recession will be longer and deeper than it otherwise would be. Most of the ways currently being discussed for squaring this circle fail to do so. There is an alternative. We should begin to consider it. The opinions expressed in this commentary are solely those of Joseph E. Stiglitz.